What category books do you write? I’m at that between stage of writing where I’m deciding what novel to write next, and I decided to do some genre research. Writers coming from the traditional world don’t usually worry about where their story falls as a genre because that’s the job of the marketing department. But as an indie publisher, I do need to worry about where my story will be marketed, especially on Amazon, where book categories can make or break the book sales. I quickly realized I didn’t know as much about fantasy and science fiction genres as I thought, especially for children and YA. 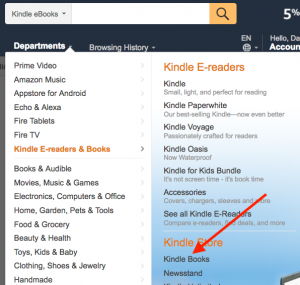 When you’re setting up a book on the Kindle Digital Publishing Program (KDP) or Createspace, both Amazon services, you may choose two categories for your book, and then later ask support to add additional categories. The categories will determine your competition and your access to the correct readers. Author David Goffman suggests that you should look at the popularity list rather than the best-selling list for Kindle books. The bestseller list shows recent best-selling books; the popularity list takes a longer look at which books are popular and selling over a longer time period. 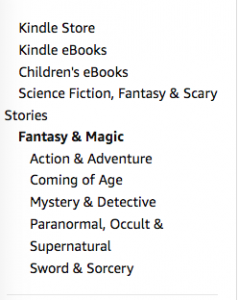 Notice that we’ll be talking about researching Kindle categories because you can directly choose these. However, children’s books often sell better in paperback. 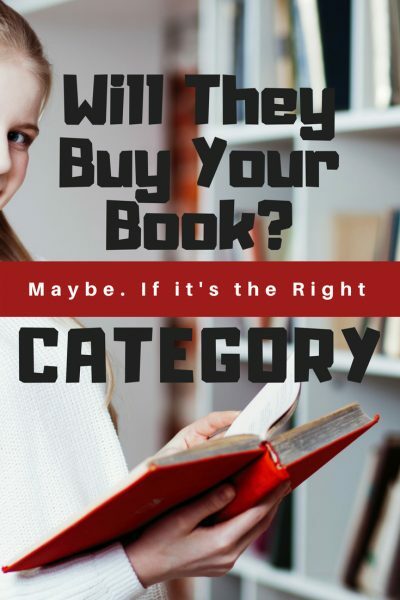 The paperback store doesn’t break down the categories into the sub categories or subgenres, so it’s difficult to do this research for paperbacks. Keep in mind this subtle difference as research Kindle books but hope to sell paperback! It’s a little bit difficult to find the popularity list but the screenshot should help first go to Amazon’s homepage and under the search box you’ll see a listing for departments. Click on the departments choose Kindle ereaders & Books > Kindle store > Kindle books. Then on the left-hand column navigate to the category that you are considering for your book category. In fact, I don’t even want that top category of fantasy and magic, because the competition is too stiff in that big a category. You want to drill down to the most specific category possible so that you have a chance to compete well. If you’re listed in one of these five subcategories you will automatically be listed in the categories above it. So your best bet for doing well in category is defined the most niche category possible rank well there and hope that pushes you up to the category above it . The top ranked books in the category will be very high. The number 20 top-ranked book will be considerably lower in ranking than the number one book. The number 100 top-ranked book will be lower than 25,000 in rank in the overall store, so that it’s easier to rank in that top 100. Action & Adventure – heavily dominated by Rick Riordian and Harry Potter, and other traditionally published books, which means competing will be very stiff. Coming of Age – This category begins with Harry Potter (like almost every fantasy category) but an indie book by Sever Bronny is #6, and many indie titles fill the list. The #100 rank is quite low, though. Still this would be a good category for a indie fantasy book to compete in, as long as you fit the coming-of-age type of story. Mystery & Detective – this list is dominated by traditionally published books also. The rankings are lower which means not as many people are reading this category. Paranormal, occult & supernatural – while this category rocks in the YA books, it’s not popular for children’s books. The ranking of the number 20 book is almost 25,000, and the number 100 book is about 50,000. Still 50,000 isn’t bad in the Kindle store and that means almost every book in this category is relatively high. Competition is very stiff, and it might be a place where you want your book to live. Sword & Sorcery – this is a strange, messy category because it includes such diverse books such as Roahl Dahl’s Fantastic Mr. Fox, Kate the Camillo’s The Miraculous Journey of Edward Tulane, Magic Treehouse books (early readers, not middle grade), and Minecraft titles. However, it also includes books that you would normally think of sword-and-sorcery such as dragon books and typical fantasy stories. Let’s pause here and talk about rankings. You can use Kindlepreneur’s Calculator to estimate how book ranks translate into sales. Level 7: 100,000-499,999 less than 1 book per day. The calculator doesn’t give a number of 500,000. There are several ways to approach the question of which category. 1) Competition. How many books do you think you can sell a day? If you have a good idea of what your book so, you could search for the most competitive category. You may like the competition of the coming-of-age category because the lowest book is down around 225,000 which may give your book room to shine. However if your books regularly sell well you may want to jump into one of the other categories because even the number 100 book in sword and sorcery is rented about 20,000. Also notice that in two categories–Action & Adventure and Mystery & Detectives–the titles are mostly traditional books, therefore, hard for an indie book to compete. 2) Compare with past performance. Could you level up to a new tier of sales? Another way to look at the competition is to look at your past performance. Maybe your previous book never got higher than the 50,000 sales rank but for your new title you’d like to push that up to 20,000. Which would be the best category? One of the things I needed to do also was to go back and review or discover the meanings of the different categories. For example, what does sword and sorcery really mean? In the world of fantasy there are many ways to categorize sub-genres or sub-category: high fantasy, low fantasy, heroic fantasy, sword and sorcery fantasy, urban fantasy, paranormal fantasy, science fantasy, and so on. I spent some time trying to parse this out. Most agree that epic or high fantasy covers huge topics such as the rise and fall of the kingdom. Sword and sorcery or heroic fantasy is more about the individual hero. Sword and sorcery tends to have antiheroes or anti-heroines, while, of course, heroic fantasy has heroes or heroines. Urban fantasy generally is in a realm of the city. Paranormal fantasy has something of a ghost or other paranormal activity thrown in. Science fantasy combines both fantasy and science fiction into its own genre. Why does this matter? Because once you’ve done the market research some people suggest that you must also write to your chosen category. For example, if I choose sword and sorcery then I should have a story that is about an individual hero/ine or antihero/ine. And there are other tropes that go with that genre. Tropes actually means a way to organize words, such as metaphors, while schemes means a way to organize sentences, such as parallel structures. However, in the common vernacular today, a trope is a common element in the story. It might be a theme of the story, a certain type of character, or certain plot points that need to occur. I recently listened to a podcast and the broadcasters said that if you are reading widely in your genre – which you should be – you would recognize the tropes of your genre. However, I find it difficult to tell you the tropes for sword and sorcery children’s fantasy novels. The pod casters notwithstanding, it takes an analytical mind to keep in mind a wide sampling of books in your genre, and then to pull out commonalities. I think it’s a rather difficult thing to do. Or maybe, I’m making it too hard, and the generalities are more general than I think. The benefits of finding common tropes is that you hit your readers expectations, therefore, your book should be more popular and sell better. It should also help you plan and execute your story much quicker; speed writing is valued in the in the world. Fortunately, it’s easy to find some of the tropes by looking at tvtropes.org. A caveat: TV tropes is a site for TV not literature; also, almost everything it says will relate to adult fiction not strictly to children’s fiction, so you must translate that also. However here are the some of the common tropes it suggests for heroic fantasy (and THESE I could have told you). Magic. You should explain where the magic comes from, how it’s created, what are the rules of the magic, and whether the magic is morally neutral or outright evil. World building. Sword and sorcery and heroic fantasy rarely occurs in the contemporary world. The setting for these stories is crucial. A hero/heroine or antihero/antiheroine. For children’s books this is usually a child who for some reason is chosen. It might be a prince or princess in hiding, a young dragon who will grow up to take over the dragon kingdom, or an orphan who searches for his/her family and discovers s/he’s royalty. If we followed the hero’s journey, we could probably define even more tropes that would be appropriate for a children’s novel in the sword and sorcery or heroic category. That’s the level where I find it easier to get bogged down. In the end you must choose a category within which your novel will compete. We tend to think of this in terms of the content of our stories and that’s correct to an extent. However, we also need to consider the competition, and work to find the best fit for our books within the ecosystem of Amazon, and within the wider bookselling market. A deep dive into Amazon categories can give us insight that should help us position our book in the marketplace. What Amazon category is best for YOUR book? Interesting post! I’ve been going at this from the opposite direction, looking at what I think my comp titles are and seeing what categories they are in and what tropes are mentioned in the book descriptions. I was wondering if it would help to compare the BISAC categories for print books to the Kindle categories for the same title.